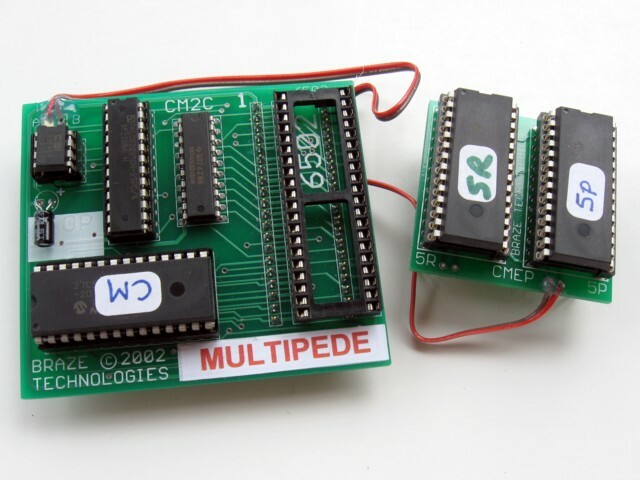 "MULTIPEDE" is an easy to install kit that extends your Atari Millipede board to play BOTH Centipede and Millipede on a single PCB set. Installs in just minutes. This is must have for any Millipede owner! Kit installs in minutes on your atari Millipede board. No soldering or special skills needed. Simply remove a few socketed chips, replace them with two new daughter cards provided in the kit, and it is ready to go! See also Trouble Shooting Guide. Switch between games at any time by pressing and holding both the player-1 and player-2 start buttons at the same time. Game will instantly reset and switch to the other game. Setup menu allows on-screen independent configuration of settings for both games including resetting of high score tables. No need to fiddle with DIP switches anymore. Ability to perform partial reset of high score tables, preserving the top scores, but erasing only the lower scores. Great for parties so everybody can have fun competing for high scores. All 8 High scores and initials are saved for both games! Uses eeprom technology which means never a battery to change and a lifetime longer than you or I will live. 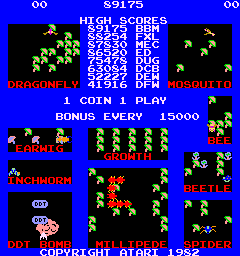 Note: Original Centipede and Millipede games only saved the top 3 scores and initials. CPU daughter card has same high quality gold plated machined header pins as used on the Asteroids HS kit. Provides a perfect mate with your Millipede CPU socket. High reliability and strength for a long lasting connection. Daughter card snaps firmly into place. See picture. Why not Millipede on Centipede? The biggest technical hurdle for making multipede work on a Centipede board, is in the video color circuit differences in both the number of colors and the ability to control colors on a per character basis. Centipede has 16 different colors (really 14 as 2 are duplicated). Millipede has 256 different colors. Related to this is how each game maps its bits in the character set. Centipede uses 2 bits for Flip-X and Flip-Y, whereas Millipede uses these same 2 bits to encode extra color information into each character and Millipede takes advantage of dedicated hardware to deal with X and Y character rotations. To work around these differences would require considerable hardware changes in the video section as well would require board modifications (possibly desoldering chips). For this reason, I have no plans on offering Multipede on Centipede hardware. Sorry. Any differences between the original games? The Centipede colors have slight shade differences than the original Centipede game. This is because Millipede hardware has 256 colors and Centipede has only 14 colors. The closest matched 14 colors were selected from the 256 available colors in the Millipede set for the Centipede game. So if you put two games side by side you might notice that a few of the color combinations are slightly different. Using MAME as a guide I have put together a web page that shows a side by side color comparision as emulated by MAME. It should be noted that even MAME's color emulation is not 100% exact, but the web page is still a useful as a guide of what to expect. Multipede has a few features that are not available in the original games including a setup menu. 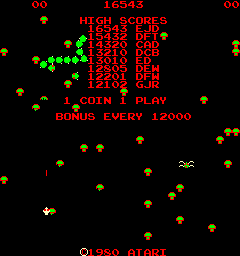 Multipede also saves all 8 high scores and initials, versus the original games which only save the top 3. Centipede test mode is not accessible. The Multipede test mode does not show the current DIP settings as these are now selected using the setup menu. With the exception of above, all sounds, gameplay, etc.. are the same as the original games. Do you offer adapters for Centipede or Jamma cabinets? Steven Gregory at www.arcadeshop.com has high quality hardwired centipede/millipede adatpers for a very resonable price. Steven also offers a variety of Millipede and Centipede replacement parts. For detailed information on how to build your own adapter see the Centipede to Millipede Conversion page created by Cliff Lawley. Who can repair my sick Millipede board? Mike Haaland at MikesArcade.com offers Millipede PCB repair/swap service. Check with him for availability and lead time. Mike provides high quality service and can also repair other boardsets too. Does my EAROM chip/circuit need to be functional? No it does not. The Multipede kit contains is own high score save chip and does not make any use of the original EAROM chip on the millipede board. This means, for example, if you are using your millipede board in a cabinet that did not provide the higher voltages needed to drive the EAROM, you can still make use of the multipede kit and still have your high scores saved. It also means if your board was functional with the exception of the EAROM chip/circuit that you can still also make full use of the kit. 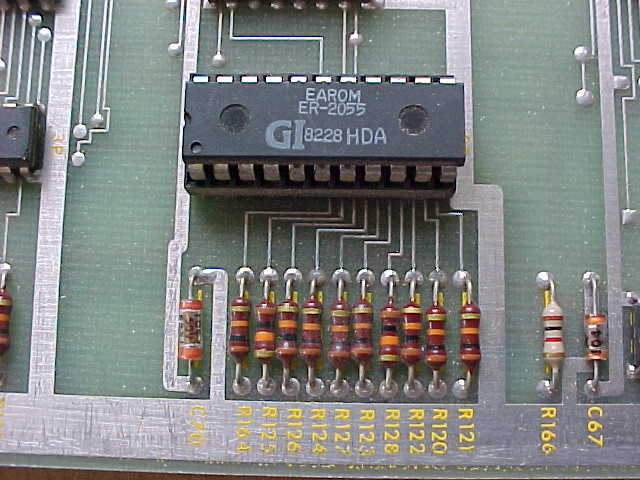 It also means, if you want, you can remove the EAROM chip and use it on another Atari board or even sell it.